Gayatri Polychem silicon defoamers and silicon antifoams are high performance silicone based products containing non- ionic surfactants and functional additives. Foam formation is the result of dissolved molecules in a liquid. The dissolved molecules alter the surface tension of the liquid, and can be viewed as surface active agents (surfactants). The surfactants can be non-ionic, cationic, anionic, or amphoteric. The liquid can be either aqueous, non-aqueous, or both (some industrial systems may contain dissolved organics which require special consideration). Different surfactants will generate different types of silicone antifoams, antifoam emulsion, silicone antifoam emulsion and foam stability. When agitated, bubbles will form, which will immediately encounter gravitational effects pulling liquid along the bubble walls back down into the liquid beneath the bubble. A simplified picture of a bubble can be described as spherical, having both an outer wall and inner wall. When the surface tension is high enough, bubble formation becomes more rigid and stable. If a bubble is subjected to mechanical agitation, bubbles caused by entrained air, would form very stable lamellar structures. The Marangoni effect is a major stabilizing factor in foam, and is driven by osmotic pressure. In some cases, the aqueous liquid is being pulled through the bubbles'' walls creating regions of low and high surfactant concentrations, which sets up a gradient along the bubbles'' surface. The gradient would pump liquid back onto the bubble walls, where this phenomenon is referred to as a surface transport. The bulk viscosity also contributed to foam stability. As the viscosity of liquids increase, entrained air, now a bubble, can be trapped below the liquid’s surface. Increasing viscosity of the system also reduces the coalescence capability of smaller bubbles merging to become larger bubbles. If the bubbles become large enough (increasing the diameter), bubble stability decreases. Our offered GP SD 211 Compound is a silicone defoamer and is incredibly effective in very low concentrations. This is widely used as a versatile defoamer, in industrial applications. 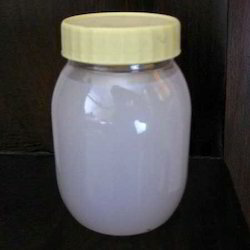 This type of additive is offered in stable emulsion form that is soluble in cool water. Moreover, as this is required in small concentrations they are highly cost effective. GP 171/340 Heat Sink Compound is suitable for thermal coupling of electrical/electronic devices to heat sinks. The product should be stored in its original packaging with the cover tightly attached to avoid any contamination. Store in accordance with any special instructions listed on the product label. The product should be used by the indicated Exp. Date found on the label. In general, the product is resistance to minimal or intermittent solvent exposure, however best practice is to avoid solvent exposure altogether .